Exclusive! 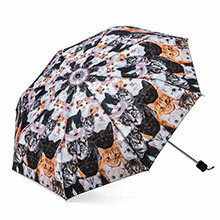 Keep raindrops from falling on your head with our fun Raining Cats Umbrella! 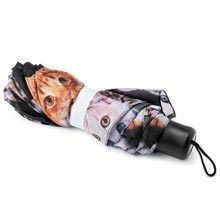 Large enough to keep you dry during heavy rain, yet folds up small enough to slip easily into a bag or purse. Polyester. Imported. 36" dia. open; 9½"l closed. there is no button on the handle to release the umbrella to open nor to close this. I cut my finger trying to get it up and down. Is not like my other umbrella . I do not recom. this for anyone. I donated my brand new one to a donation place, maybe someone will have better luck than I did. Cute design tho on umbrealla.